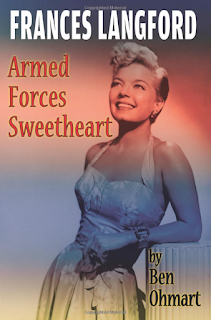 To date there has never been a biography about Frances Langford in print form, which makes Ben Ohmart's latest contribution to the reference library all the more valuable. She really was the Sweetheart of the Armed Forces, once quoted of saying "God knows I would gladly give my life to help end this terrible affair and send those boys home to their families and friends where they belong." With her vocal talents as both movie star and radio personality, her career has been immortalized in recorded form. Her personal life restricted to the tabloids and gossip columns of the times, she donated everything she owned -- including letters, scrapbooks and photographs to the Martin County Historical Society in Minnesota. 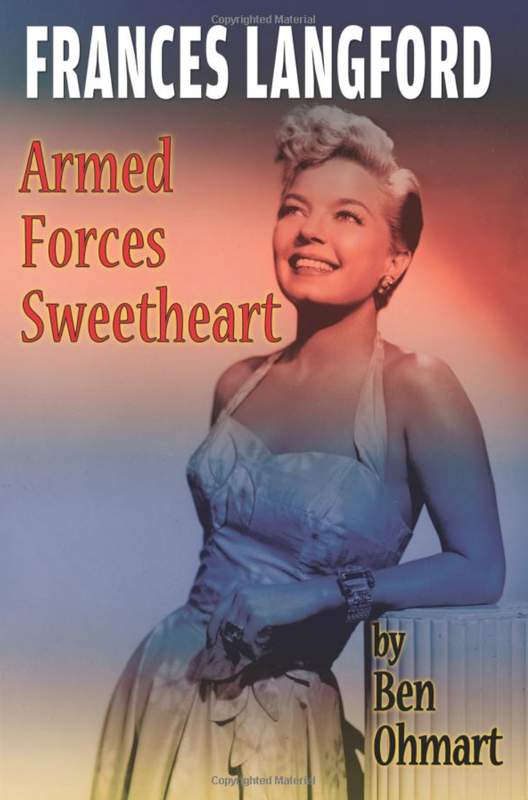 Anyone can visit the Elliott Museum and browse through her collection, but Ben Ohmart saved us an expensive trip across the country with this 333-page book documenting her personal life, her radio career, her screen career and more than any other aspect of her career... what she devoted to troops overseas. "Frances cared a lot about her war work," Ohmart explains, "and more than anything, I wanted this book to showcase her amazing patriotism." Chapter three focuses on her tour with Bob Hope for the U.S.O. I could go on paragraph after paragraph of what this book contains but if you are seeking a biography that covers all aspects of her life and career, this is the book. The most impressive aspect is the fact that this book features hundreds of never-before-seen photographs from Langford's personal collection and are a rare treat. Most biographies have a handful of rare photographs, sometimes as a centerpiece in the middle of a book. Ben Ohmart gave us not just a slice of the pie, but multiple pies of various flavors. The photos alone are worth the price of this book. Remember to scroll to the bottom of the page and subscribe by e-mail! It's Free! Receive each weekly blog entry vie e-mail for free! Visit the Author's Web Site! © 2011, 2012, Martin Grams Jr.. Simple theme. Theme images by i-bob. Powered by Blogger.